As mentioned, I had the huge pleasure of heading down to Boston’s First Night celebration to see the Post Meridian Radio Players perform two works — “Countdown to Chaos” the pilot episode of Red Shift, Interplanetary Do-gooder and a live rendition of Arch Oboler’s “Chicken Heart” (again, hear the studio version in this week’s ‘pod!). When I say pleasure, I mean seeing the PMRP put on the play was great. Digging myself out of the woods, driving through an onslaught of snow paired with slushy and grimy roads, then riding a train for over an hour and having to navigate some cold streets of Boston wasn’t the raddest experience ever. Luckily, I was with my girl and Scott Hickey of AM FM Theater (makers of the Grist Mill) so I had plenty of company and some great chats on the way! 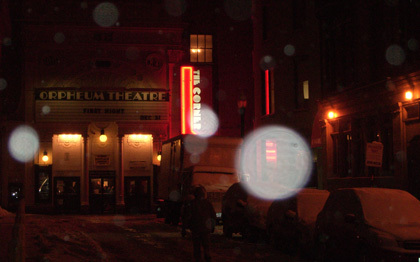 The Orpheum is tucked into a little alleyway off from the major boulevards of New Year’s Eve craziness, and the funky, old-school artistic look cast a great mood for a live radio drama. We got in just as the doors opened and set-up-shop with a shwag-stand operated by PMRP members. They were also doing a live SFX demonstration, and I couldn’t resist asking this fair lady with the propeller on her head what all the cool gadgets on this table were used for! We got some decent seats near the front (thank goodness we were early — the place really did fill up!) and then sought out Neil Marsh, the “man behind the curtain” for this evening’s show, who was at the sound board when we first saw him. “Countdown to Chaos,” a fantastical farce of science-fiction fervor was the lead, and a nice way to introduce the audience to the kind of performance they were to expect. I actually hadn’t heard an episode of Red Shift, but by design this was a nice way to start — the plot was not, uhm, overly complex, but delightfully lampoonish of B-rated sci-fi standards. Villians were particularly vile, the heroes goody to a fault, and the bumbling and curious people of Earth typecast enough to be familiar but unique enough to make it fresh, engaging, and original. Chicken Heart, the infamous tale, done with live foley effects and in true OTR style. They kept the script close to the original — Ionized Yeast ads and all — though the cast brought fresh energy to the performance and the SFX table (of which I failed to get any good photos at all) did a stellar job. You should’ve seen the collection of goopy goodies and squishy squashes they had for the sounds of the “Heart”! Another special mention goes to the ASL interpreters, who had the daunting task of converting a full-cast, sound-effect and music production into a visual form. But man, they were great! They gesticulated wildly, played off each-other, and even conveyed mood of music and effects. For a completely “aural” medium, making this into an enjoyable visual experience was quite something. On that same note, another hats-off to the performers who all dressed up in simple costumes to make the stage presence a little more interesting. The shimmery silvering things Red and Lumpy were wearing might not have made much difference on the radio, but it sure made watching the show more enjoyable! Overall, it was a great night, well worth the travel, and gosh, does it make you wish more of this was being done. Good job, PMRP, and hope to see you next year! I remember WMAL in Washington, DC playing “Chicken Heart” every Halloween when I was a kid many years ago. It introduced me to Old Time Radio since I was legally blind and before you know it I was hooked on shows from “The Halls of Ivy” to “Gunsmoke”. I look forward to listening to the tribute and hope to see you this year at the friends of Old Time Radio Convention in Newark, NJ.